The canter is the most expressive and — when properly executed — most beautiful of the standard gaits. While some make a distinction between the canter and the lope, most people use the term lope for the western equivalent of the canter. In both instances, it is a three-beat gait. The canter or lope is made up of three footfalls followed by a period of suspension. One hind foot first strikes the ground. This is followed by the opposite hind foot and its diagonal forefoot. Then comes by the other forefoot. The horse pivots its body over this foot. It then glides through the air and regroups its legs to begin the next stride of the canter. The canter is said to be performed in a right or a left lead. The right lead is initiated by the left rear foot striking the ground. This is followed by the right rear and left front moving in unison. Finally, the right front foot reaches out taking the weight of the body. The horse's body pivots over this foot and glides through the air before the sequence of steps repeats itself. The left lead is initiated by the right rear foot, followed by the left rear/right front diagonal, and, finally, the left front. When cantering circles, it is easiest on the horse and smoother for the rider to canter the right lead when going clockwise (on the right rein) and the left lead when going counter–clockwise (on the left rein). Many consider that the lead as being determined by the front foot which the horse pivots over. I prefer to think of the alignment of the horse's shoulders and hips. In the right lead, the horse's right shoulder and right hip are held slightly in advance of its left shoulder and hip. In the left lead, the left shoulder and hip are held in advance of the right shoulder and hip. This is much the same as a humans hip alignment when skipping. 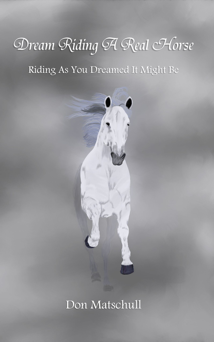 I once heard a young girl experiencing her first canter, yell: "I'm flying. I'm flying." She was, in fact, flying during that period of suspension between the last footfall of the one sequence of steps and the beginning of the next. The height and length of that gliding flight is determined more by the impulsion of the horse than by the quickness of its movements. Some describe the canter as the fastest of the standard gaits aside from the gallop. But it is the sequence of footfalls, not the speed, which establishes the canter. Some horses can canter with a slower forward motion than others trot. A few horses have even cantered in place or even to the rear, though this "canter" usually takes on a four–beat rhythm. A horse's inside hind leg provides most of the trust required in the canter movement. Horse's commonly avoid this extra effort by carrying their hindquarters to the side, especially in one lead. See the section on lateral movements for information on exercises designed to eliminate this evasion. Some riders are reluctant to canter fearing that the horse may run off with them and they might fall off. A canter, however, need not be fast. Whether fast or slow, most riders find the canter to be easier to ride than the trot because of the smoother action of the movements of the horse. While smooth, the movements of the canter are generally greater than those of the other gaits. While a horse's head moves in order to maintain balance during the walk, this same balancing movement is more pronounced in the canter. The rider's hands must be able to move an even greater distance to follow the motion of his horse's head, and his arms must open and close to a greater extent. The rider's pelvis must, also, be free to move a greater distance in order to follow his horse's back. The angle between the torso and thighs will open and close more than in the walk or trot because of the longitudinal rocking motion of the horse's back as it bounds upward and forward only to come down again. At the same time, the rider's pelvis will be positioned on an angle horizontally to the direction in which the horse is traveling if the rider's hips are in line with the horse's hips. If a rider is tense, his body cannot follow his horse's movements. He may find himself bouncing and slapping the saddle with his seat. To alleviate such bouncing, some riders "polish" the saddle with their seat. As the horse canters, the rider's seat slides forward and rises slightly out of the saddle at the extent of its forward movement. It, then, returns to the back of the saddle since the horse has moved forward beneath the rider's raised seat. Then, the motion is repeated. While this may be better than bouncing, it is not the best method to ride the canter. A relaxed rider should easily be able to remain in the saddle as if glued in one place. As the rider's seat follows his horse's movements, the rider feels his seat rise, dip downward, and glide upward once more as the saddle moves with the horse's back, but the rider's seat does not move from its position in the saddle. This action may be likened to sitting on a bench in a boat facing oncoming swells. As the boat rises and drops it also dips forward and backward. The person's pelvis follows this motion, but his body remains basically upright. At the same time the longitudinal rocking motion is occurring in the canter, some lateral swaying occurs as the horse's alternating hips rise, fall, and rotate. The rider must resist the temptation to squeeze with his legs and hold on. Instead, he should let gravity and a lower center of gravity as described in the section on the seat keep him stable as he lets his body move freely move to stay in balance. The lack of muscular tension also allows the rider's hands and arms to move freely to follow the action of the horse's head and neck. It is sometimes advantageous for the rider to lift his seat out of the saddle and incline his body forward, especially if the horse is traveling fast. If the rider leans forward, he should bring his hips backward to stay balanced over the stirrups. 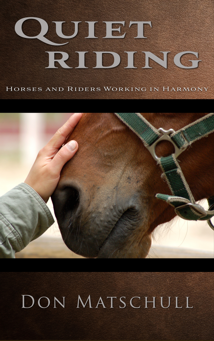 While the rider's legs may adhere to the horse's sides, they should not squeeze. Squeezing would cause tension in the rider's muscles inhibiting his ability to follow his horse's movements. His tension would likely cause tension in his horse which would lead to a degradation in the horse's movements. While the position described above may be useful in some instances, a balanced sitting position in the canter offers the rider more contact with his horse and, therefore, greater means of communication. Some riders feel it necessary to re–cue during each stride of the canter. However, simply moving with the horse should be enough to encourage the horse to continue cantering. If a relaxed and balanced rider senses his horse getting ready to fall out of the canter, he can always re–cue then. More methods have probably been developed for cuing a horse to canter than for cuing for any other gait. These range from pushing a horse to move forward so fast it can no longer trot and simply falls into a canter to a variety of more sophisticated methods. Some riders use unilateral aids such as the outside rein and outside leg or the inside rein and inside leg. Others use bilateral aids such as the inside rein and outside leg. Still others use both legs and both reins. I have even gotten a horse to canter by simply drawing my inside hip forward. A rider should consider why he might use any particular method and which method might work best with a particular horse at a particular time. The rider should also consider what method would bring about the best movement in the horse, keeping it straight and balanced.